African Environments is pleased to announce its involvement in a new anti-poaching initiative in conjunction with Tanzania National Parks and Frankfurt Zoological Society within the Serengeti National Park. For every client staying in our Pembezoni Camp African Environments will donate to the Serengeti De-snaring Program. Stakeholder funds have already set up two teams, made up of armed TANAPA Rangers, local villages who may have also worked as poachers in the past as well as a retired Parks Rangers who bring with them a huge amount of experience of the area and snaring within the region. 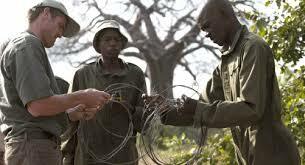 Animal snares are most often set by poachers to capture smaller, more abundant animals to be sold for bush meat. These snares also capture and injure larger and rarer animals like big cats and elephants that is having devastating effects on the eco-system. African Environments is proud to be part of such an effective and worthwhile cause. Since the project’s inception Frankfurt Zoological Society has reported that it has has been hugely successful, de-snaring large areas of the Park. It is hoped that with further financial support this collaborative program will expand with more vehicles and teams to impact the entire Serengeti. African Environments is excited to be part of such a worthwhile and important collaboration.